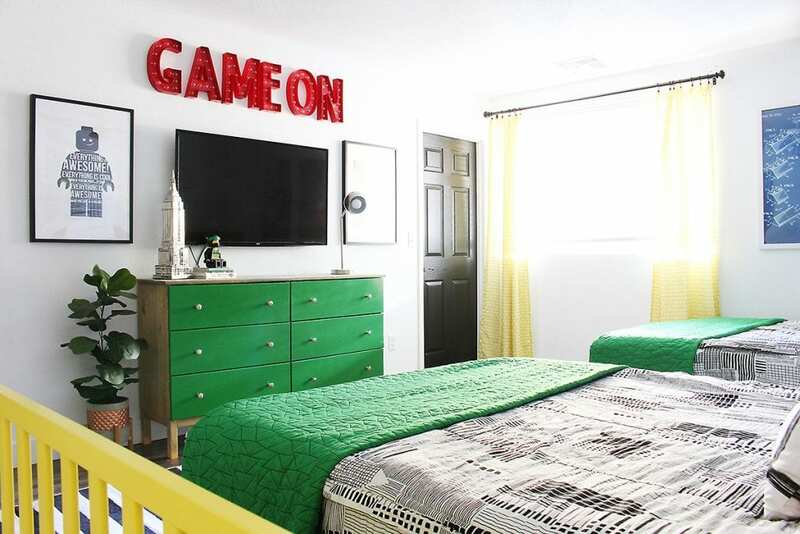 My boys lego room revamp is finally done and we are so in love with it! 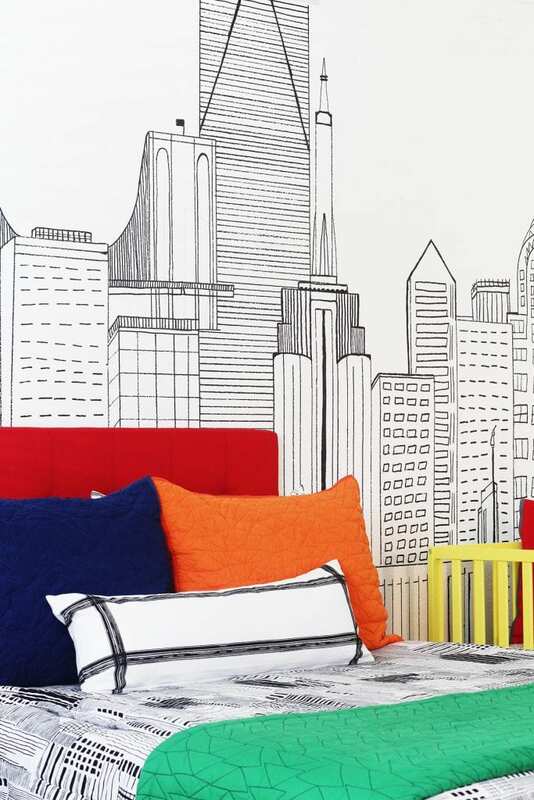 The hand-drawn skyline takes the lego room to the next level. 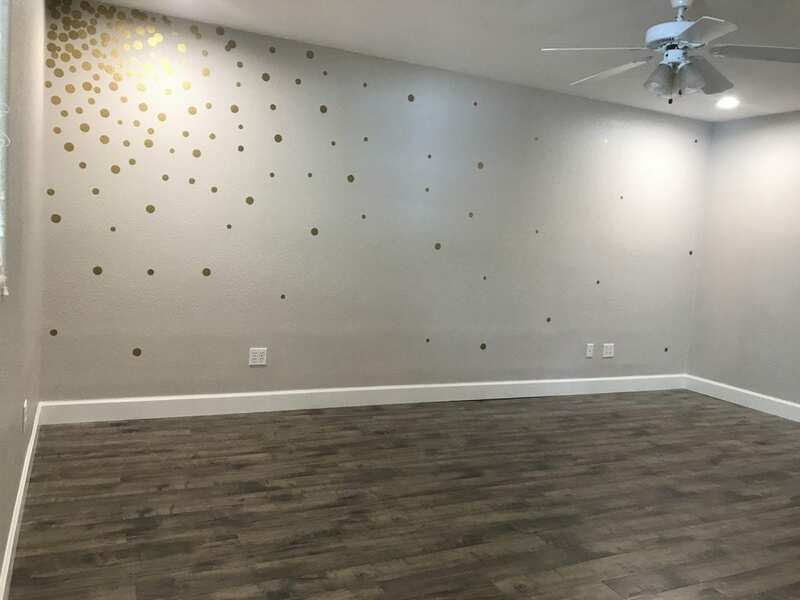 Floors and Walls – First, choose what you want for your walls (and flooring if this is a full remodel). I painted all the walls white (Behr Frost) and did a hand-drawn skyline on the wall (tutorial coming soon) to set the tone for the room. We featured some of our favorite buildings. I wanted a hand-drawn look so I used a straight edge and a Sharpie Paint Pen to draw the design. I chose a black and white striped rug for the floors. Because this is a very large room, I chose a 10×13′ rug that covers nearly the entire floor. 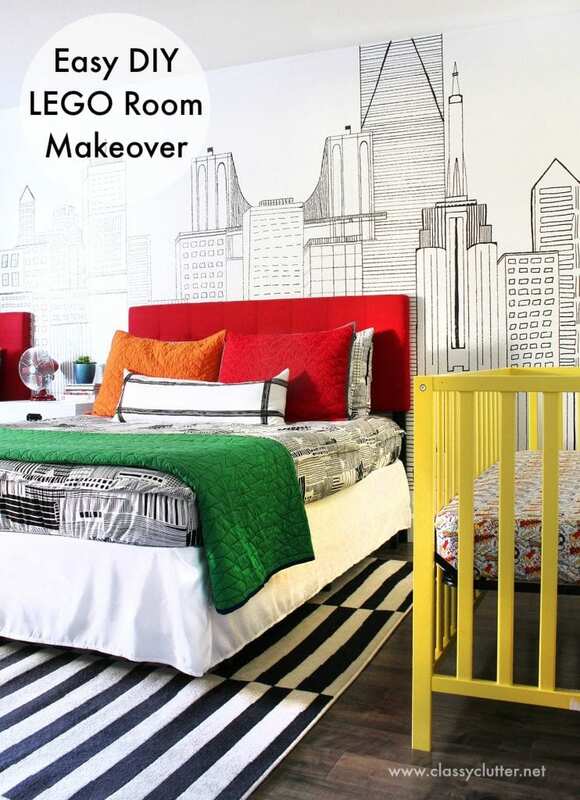 Choose your furniture – Since I knew the rug, walls and bedding was going to be black and white in the Lego Room, I opted for colorful furniture including red headboards, yellow crib and green dresser. The colorful furniture makes the walls and rugs pop! For the nightstand, I went with black and white again to balance the red headboards. Wall Art – I painted the GAME ON marquee letters. Then, mixed up black & white and colored prints in keeping with the Lego theme. I found all of the prints on Etsy and had them printed at Staples. Find out how to print oversized prints by watching this video. 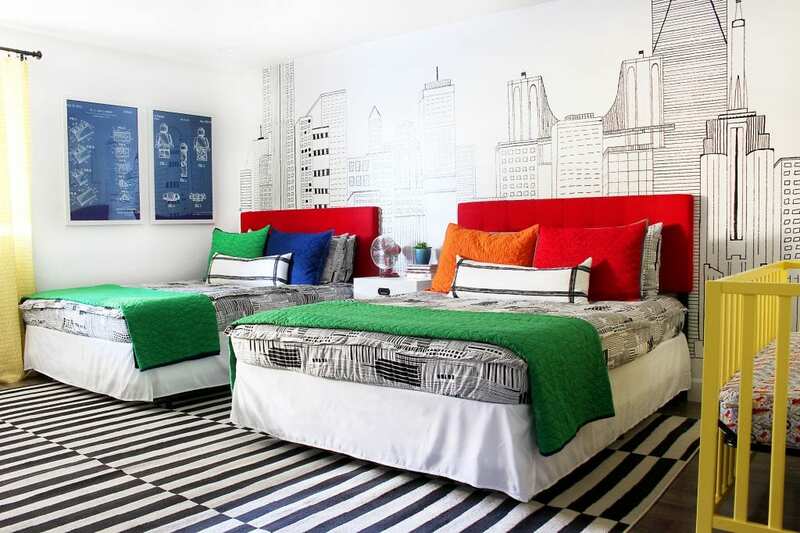 Accessories – I mixed a variety of colored textiles (pillows and curtains) and some Lego themed decor for their Lego room. I added some faux plants and that’s it! 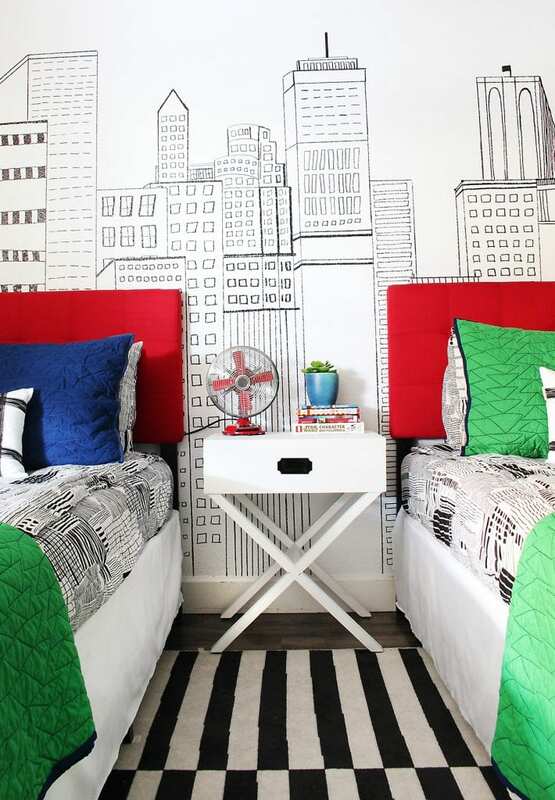 New York New York Beddy’s – Remember to use CLASSYCLUTTER25 for 25% off of your order! that’s so fun!! they must love it!! I’ve been waiting and waiting…was there a tutorial done for the adorable skyline wall? Hi Ladies! was a tutorial of the skyline ever made? I’m going to do the Seattle skyline in my sons room and would love all the tips! Thank you!! !